As a global movement supporting multi-stakeholder and multi-sectoral action at country level, the SUN Movement embraces the interconnected approach that characterises the 2030 Agenda for Sustainable Development. This complex and ambitious approach comes with its own challenges. 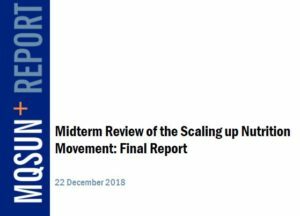 Mid-way through its 2016–2020 Strategy and Roadmap, the SUN Movement commissioned a Mid-term review (MTR) to assess how far SUN-supported actions, and in particular SUN structures and processes, lead to nutrition impact. Findings show that the SUN Movement has many strengths. The report notably showcases the energy and creative thinking that exists within the Movement. However, more needs to be done if it is to seriously ‘move the needle’ on the many issues that its members face in improving nutrition. The MTR recommends the SUN Movement to reposition and re-energise itself within the changing international environment on development and nutrition. While continuing its focus on undernutrition and the ‘first 1,000 Days’ window, the SUN Movement should position itself to help its members address the increasing ‘multiple burdens’ of malnutrition: this is important for its relevance to many of its members. In addition, the MTR encourages the Movement to keep a strong focus on concrete impact at country level and on the sustainability of SUN interventions. This involves paying greater attention to mutual accountability, improving learning and knowledge sharing, and reinforcing an impact-driven governance that engages countries and SUN stakeholders, so they can buy into a renewed vision, with a real commitment to change. The MTR report is now already available in English, and soon-to-be in French, Spanish, Portuguese and Arabic.